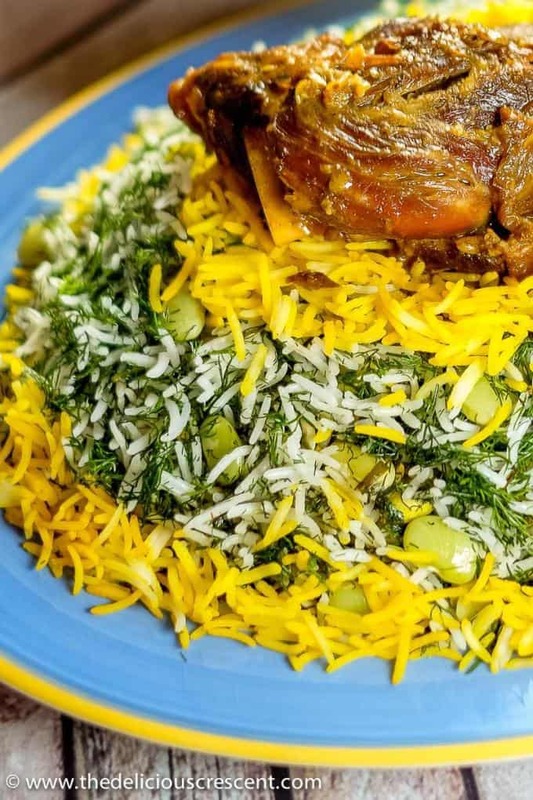 Baghali polo or Persian dill rice is a fragrant and fluffy rice dish that pairs the pleasant flavors of dill, basmati rice and saffron with plump soft broad beans. All topped with a delightful crunchy golden crust. Find out what makes this rice so famous! This rice recipe goes SO WELL with my popular Braised Lamb Shanks. 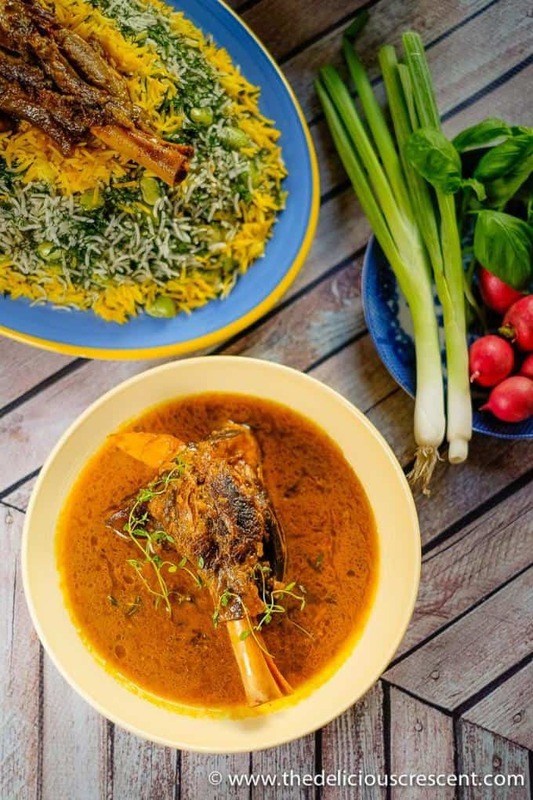 Baghali polo is the famous Persian dill rice with fava beans. It is a traditional favorite and a definite item on Persian restaurant menus. Baghali means fava beans or broad beans in Persian (Farsi). When these beans are not easily available, many recipes substitute the more easily obtainable lima beans. 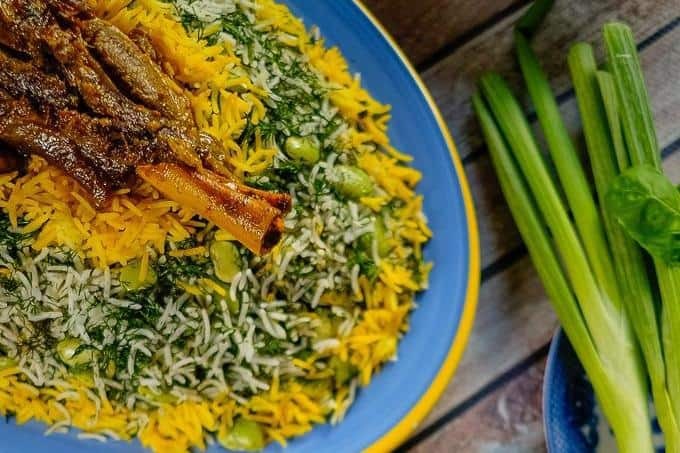 This is by far one of the most popularly requested Persian rice recipe from my friends and family. How to Make Restaurant Quality Persian Dill Rice? This is a simple recipe that uses few ingredients. What are essential for restaurant quality taste are excellent basmati rice, finely chopped fresh dill, good quality original saffron and butter. At home I usually make this rice with olive oil, but traditional recipes use butter. One option for special occasions is to use olive oil for the most part and use some butter for the crunchy rice crust (tahdig) and/or a light drizzle on top at the end. Below I have outlined the steps for making this popular Persian dill rice. Cook basmati rice and lima beans for baghali polo. Check the rice for doneness and drain the rice and lima beans in a colander. Lay the potato slices to make the crust and place the first layer of basmati rice for Persian dill rice. Make alternate thin layers of basmati rice with lima beans and dill weed. Sprinkle grated garlic with chives and saffron water for the dill rice. Seal with foil and bake baghali polo and serve. 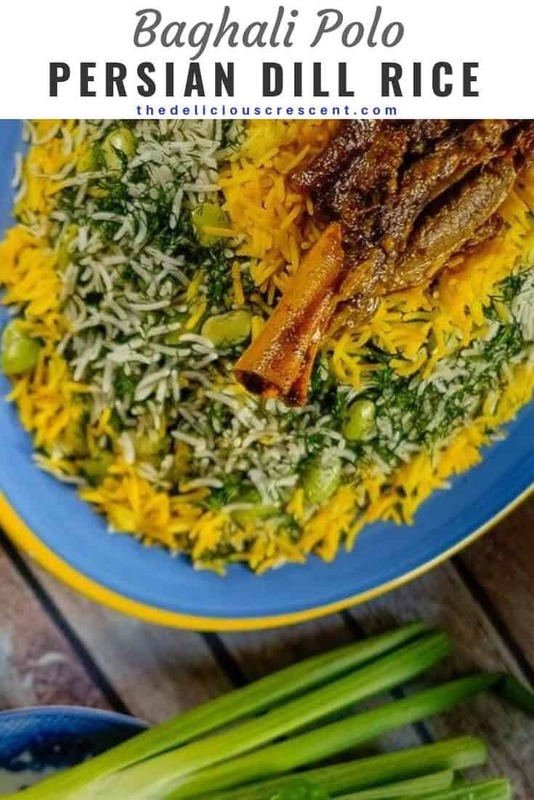 Persian dill rice with baghali (broad beans) is often served with lamb. My favorite is lamb shanks and which is also the more popular option. But lamb chops or whole leg of lamb also work very well. This herb rice can also be served with chicken (in gravy, baked or whole roasted chicken) or fish (fried, grilled or baked). 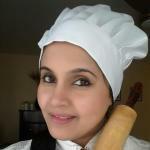 I made this baghali polo with an amazing recipe for tender lamb shanks. Dill preparation: Rinse the dill and spin it through a salad spinner. Spread it out on an absorbent kitchen towel and cover with another towel. Allow the moisture to absorb very well for several hours or overnight. Now the dill weed will be much easier to chop finely and you will have fresh dill that is easy to sprinkle it evenly over the rice, without being clingy. When boiling the rice in the method used here, make sure to watch the time (4 to 5 minutes) and the rice should be soft at the tips and have a white dot in the center. It should still hold its shape well. Rice cooker: Use 1¼ to 1¾ cups water per cup of rice. The amount of water needed differs with age of the rice. For rice cooker method video check this Persian lentil rice with cranberries or Saffron rice recipe. Stove top: Use a non stick cooking pot or a conventional heavy bottomed pot. Arrange the rice and dill layers in the form a pyramid, which helps to create a crust. Rice crust: Mix couple big scoops of cooked rice with 2 to 3 tbsp yogurt, 2 tsp of saffron water and spread a thick layer evenly over the oil or butter in the bottom of the dish. Tip: Adjust the rice-yogurt mixture used according to the size of the pot used. It is already gluten free. However, these other options are possible. Vegan/Dairy Free: Use only oil and skip the use of ghee, butter or any yogurt for the rice crust (if making). Lower Carb/Grain free: I have not tried this but you could try replacing basmati rice with cauliflower rice. Healthier: Although white basmati rice is commonly used for Persian dill rice, you can easily replace brown basmati rice, adjusting the cooking time for the rice. You could even try combinations with some wild rice or quinoa. You may substitute lima beans with edamame for a variation. This rice recipe uses loads of fresh dill and a good amount of lima beans. Dill weed is a good source of dietary fiber, vitamin C, calcium, iron, magnesium, potassium, manganese and carotenoid phytonutrients. Research studies with dill weed have revealed the anti-inflammatory and antioxidant properties of this herb. The monoterpenes found in the oils from dill weed have also shown chemopreventive effects in a study. Lima beans are a very good source of fiber, folic acid, protein, iron, magnesium and potassium. They also provide a good amount of thiamin, vitamin B6 and other vitamins, minerals, antioxidants, phytochemicals and sterols. 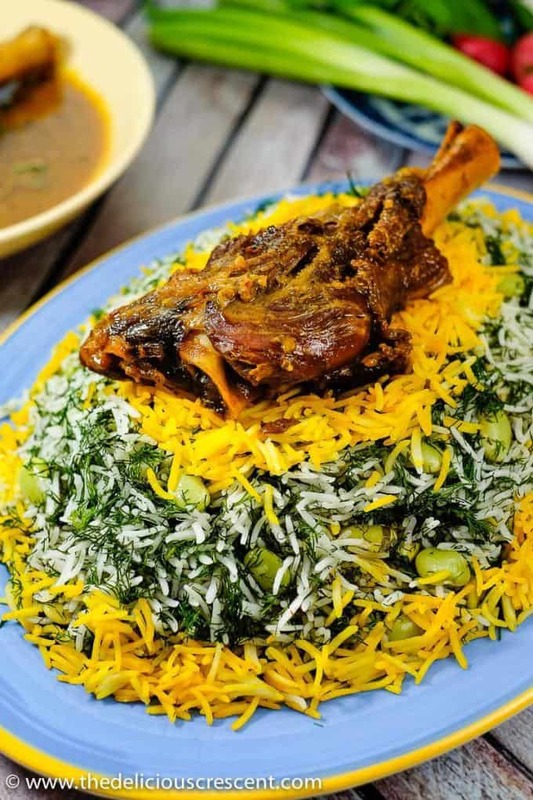 Baghali polo or Persian dill rice is a fragrant and fluffy rice dish that pairs the pleasant flavors of dill, basmati rice and saffron with plump soft broad beans. All topped with a delightfully crunchy golden crust. Boil 10 cups of water with 2 tbsp salt in a large cooking pot. Add basmati rice and boil at medium high to high heat for 4 to 5 minutes until rice grains are soft. Stir the rice while it is cooking. Drain rice in a colander and set aside. Potato crust (optional): Heat 2 tbsp of olive oil or butter in oven proof dish such as Pyrex baking dish. Spread the oil or butter evenly and sprinkle half the salt, pepper and coriander/cumin seeds (if using).Next arrange the medium thick potato slices. Then sprinkle the rest of salt, pepper and cumin. Spread a layer of rice, followed by sprinkling a thin layer of dill weed. Mix the grated garlic and chives and sprinkle some of it. Assemble the dill rice by making several alternating thin layers of rice, dill weed and sprinkles of the garlic-chives mixture. Finally top it with a rice layer. Pour 4 tbsp olive oil or melted butter all over and then sprinkle the saffron water. Cover with a sheet of aluminum foil and seal well. Bake for an hour or more until steam builds up well. If making the crust (tahdig) it should be golden. Transfer the baking dish from the oven and let it rest a few minutes. Take some scoops of the top layer of saffron colored rice and set it aside for garnish. When the steam has released a little, gently mix the top layers of rice and dill and plate it on a serving dish. Arrange the potato slices all around and sprinkle the saffron rice for garnish. Persian baghali polo goes well with a yogurt salad such as Persian yogurt dip with shallots. You can make this same recipe in a cooking pot on stove or in a rice cooker (see the blog post and notes below). You can use rose water to dissolve the saffron instead of plain water for a subtle flavor, if you prefer. You may sprinkle 1/2 tsp cumin between rice layers or add couple of split cardamom pods to the rice when it is boiling (discard pods later). You could use 4 tbsp chopped green garlic instead of garlic + chives. If you want to give a brighter color to the lima beans, you can boil them separately with 1/4 tsp of turmeric. You may use fresh, frozen or dried fava beans instead of lima beans. The beans need to be shelled. The dried beans need to be soaked overnight. Make Ahead: You can have the chopped dill ready the day before. The dill rice freezes beautifully. Just thaw and reheat it. Check the full blog post above for more variations. Nutrition Facts: No salt or potato crust included. This post was first published on September 26th 2018 and has been updated with improvements in recipe formatting, tips and additional enhancements. What is the basmati price brand you use? when i cook, the price always breaks and does not look as long. Try India Gate brand. Make sure not to overcook the rice. Needs only 4 to 6 minutes. Soaking the rice prior to cooking and draining may make the rice grains stronger.